Real Clear Science has chosen 11 cases for inclusion in its Biggest Junk Science of 2013 and one of them is the decision by Portland, Oregon voters in May to reject community water fluoridation. Many of the city's registered voters did not cast ballots, and many of those who did were undoubtedly swayed by inaccurate claims and misrepresentations of the scientific evidence. Of the 30 largest cities in the U.S., Portland is the only one that does not fluoridate its drinking water to help prevent tooth decay. Fluoride exists in virtually all water supplies, but usually not at a level that has been found to reduce decay rates. 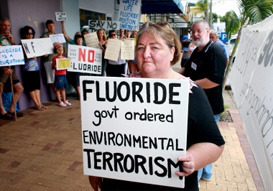 This is why most public water systems fortify their water with additional fluoride. The Centers for Disease Control and Prevention has endorsed this practice and even named fluoridation one of "10 great public health achievements" of the 20th century. ... is drowning under a hailstorm of counter-arguments that look, sound, and seem rational. Except that they aren't. ... we rage about lobbyists and we put up signs that tell people not to do something that practically every other major city in America has done, some for decades and none with any sign of catastrophe. Never mind that many of you who might be leaning toward "no" won't be the ones who suffer: it'll be poor kids whose lives are more complicated than "why don't they just brush more?" Make no mistake—those who vote "no" will be voting against the class of people Portland is famous for supporting. It’s the fourth time Portland has rejected the public health measure since 1956. It’s the fourth time they’ve gotten the science wrong.